Chokidar EQ, Other software EQ from Noisebud. Noisebud has released Chokidar EQ, a five-band processor which also happens to be the swedish developer's first equalizer plugin. 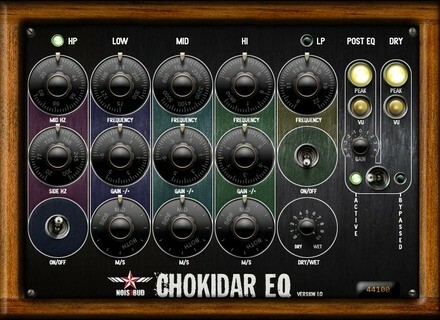 According to Noisebud, Chokidar EQ aims at balancing while mastering. The plugin is derived from an ingenious analogue concept they made - but this time without the amount of noise that the hardware version did provide. A free, 3-band stereo version is available, while the paid version features additional hi-pass & lo-pass filters and mid-side settings for $11.99, with both versions also featuring a dry/wet knob and post-EQ gain setting. Until the end of January, the Chokidar EQ is available for 30% off using discount code chokidar, while the same 30% discount applies on Noisebud's All Plugins Bundle using code chokchok. Also, previous donors for the "All Plugins Bundle" can upgrade their bundle to the latest "All Plugins Bundle 2016 Q1-2" (which includes the new Chokidar, Burt 2.0 and v1.61 of Listen) for $3.99. As usual with Noisebud, both the free and paid versions are 32-bit VST only. More details at www.noisebud.se. Three new special discounts at Waves today Like every Saturday, Waves offers special prices on a new selection of three plugins.